Living in God’s best can become a lifestyle—a permanent address—rather than somewhere we go to briefly escape the pressures of our lives. 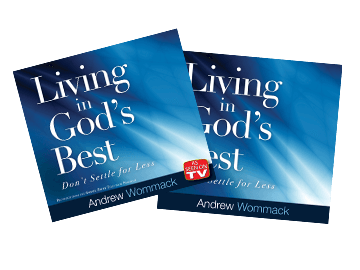 In Andrew Wommack’s new hardcover book, Living in God’s Best: Don’t Settle for Less, you’ll learn how to walk in freedom, raise your expectations, and be persuaded that living in the blessing is better than receiving a miracle. Be one of the first people to receive a copy when it releases on February 21 by preordering your book right now. All orders go through Amazon.com, so you can have it delivered to your door and get started reading right away! By preordering, you’ll be joining countless others who will help push Andrew’s book to the Amazon.com Best Sellers list. Getting Andrew’s name out can introduce others to this teaching of God’s love and grace. It’s all part of taking the Gospel farther and deeper! Additional teaching on this subject is available directly from Andrew Wommack Ministries. Listen to the full teaching on CD or watch Andrew’s television teaching on DVD. You can order these through our online store or by calling our Helpline: 647-348-2220. Take up your residence in the place Jesus has prepared just for you. Andrew’s new teaching will show you how! * Amazon, Amazon.com and the Amazon.com logo are registered trademarks of Amazon.com, Inc. or its affiliates.